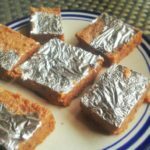 Khoya barfi made with homemade khoya got from ghee leftovers. Desi ghee is an essential part of an Indian household. All over India, desi ghee/ Ghee/ clarified butter is extensively used not only for cooking medium but it’s also considered pious and sacred and hence only Desi ghee is used for all Vedic yajna reetis. With many options available in the market, still many people prefer to make it at home as it gives not only gives a sense of satisfaction of enjoying the purest form of ghee, but is also cost effective.There are many simple ways to make homemade ghee. Methods of making ghee are 1. From Malai 2. From Butter 3.Few people add yoghurt to malai as “jaag” and let it stand overnight, they consider it to give the best results in terms of clarity and least leftover khoya. I personally like the second method as it leaves behind least of impurities and also gives out a good quantity of ghee as well. Although, there is no proof or measurement that either of the methods are better than the other two, still different people follow different ways. The first method being the easiest and least of efforts. Ghee from malai. In this method you put the whole malai/cream straight to the kadhai/bowl to heat and let it cook on simmer till the ghee separates and you have the residue khoya which turns into dark brown color.This method does give you a good amount of khoya as leftover. 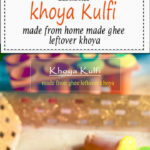 I always used to give away the khoya to my house helps, until now when I decided to make something out of it.An extremely easy recipe was born! 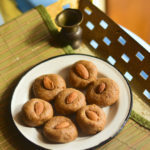 Let me admit, it tasted exactly like “Mathura peda”which invariably is a hot favorite of mine. When I made it ,I just made it to try out, but after having it tasted by a few foodies, I got a certificate of a Fabulous dish “yummy ..this is like market bought”…you should start selling them lady and etc.It gave me immense satisfaction along with pleasure that I got by biting into these rich healthy Indian squares. 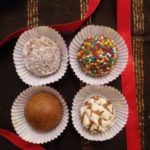 These Khoya Barfis can be made in the form of ladoos as well. But I personally like Barfis as I just love the silver work applied on them. They look beautiful as well as there are health benefits too. These can be eaten even in Vrats /Upwas/Fasting as they are made from pure khoya. 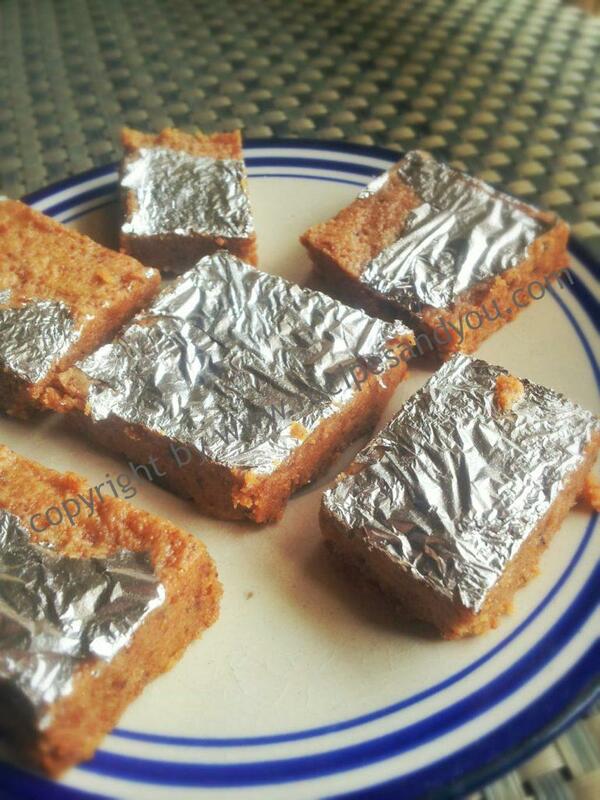 So here is the very simple recipe of the decadent Khoya Barfis! Take the khoya and churn it into the mixer till very fine. Add cardamom powder and Castor sugar to it. Mix it well. Now,pour this batter which looks like a very soft cookie dough into a platter square in shape and spread evenly. Now, leave this tray /platter in the fridge to set for 15-20 minutes. After 15 minutes , take it out and cut them into small barfis like shape.You may cut it like kaju katli shape too. Since,it has ghee into it already,in hot summers you may need to keep it in the fridge only to store. TIPS: Add or coat for desiccated coconut to make coconut ladoo or barfi. Enjoy the Khoya Barfis, rich and completely home made. Thanks Kavita. Am glad you liked it. thanks kavita.Glad you liked it. Do post your review on our fb page. Hey can v store it n then make it after few hours ?? Yes you can store this khoya in the refrigerator for upto a week.but please cool it down covered on the shelf first before refrigeration. Tried this with milkmaid n dry fruits came out Super tasty. Thanks for trying the recipe vinita. Glad you liked it. Do share your pick on our fb page. 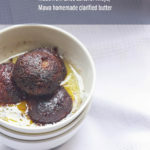 Also try the other recipes made with leftover khoya on my blog. You may like them too. O this is just yummy! Thank you! wow!what an instant recipe u have suggested!thanx a lot! Am glad you liked. Thanks. No need to cook the khoya sugar base wth milk or anything?? No Tripti the khoya is the residue post making ghee and its already cooked. I have made as per ur receipe added almond powder…its just yummy…..before i use to throw away or my maid use to take away…. Hi Sangeeta. Thanks a lot. Am glad you liked the recipe. Adding almond powder was a lovely idea. Yes you can store this in the fridge upto 10 days.thanks for sharing with us.